Preschool is a magical place made just for kids – child sized furniture (and bathrooms), interest centers with a child’s favorite kind of play, predictable routines that flow with the rhythm of children’s needs, new friends who laugh at the same silly things, and creative loving grown-ups who actually choose to spend their days with children. Preschools celebrate childhood! 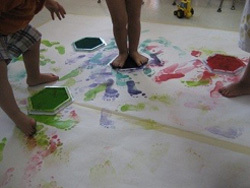 They celebrate innocence and curiosity, messy play and the building blocks of lifelong learning. Preschools comfort and encourage, accept and strive. Preschools are extensions of home, places where children learn to love and love to learn. The best of preschool is what’s best for children in a high pressure world of more, more, more. So, with back-to-school only weeks away, it’s time to focus on what kids really need and to build strong relationships with schools. Children can get easily lost when parents and schools become overwhelmed with the preschool “race to nowhere” – drill and kill reading-writing programs, nonstop enrichment activities, red-shirting summer birthday children, and passive hands-off “educational” experiences. Learning, especially for children, is not all “in the head”. Preschoolers need physical play to integrate brain functions. They need multi-sensory texture experiences to develop fine-motor skills as well as higher ordered thinking. Most importantly, they need loving relationships to initiate and retain learning. Children need to play to grow, learn and thrive. To paraphrase Lisa Murphy, the Ooey Gooey Lady, we have a generation of kids who can read at four years old but cannot get their bucket back in the sandbox. Too many children perform well on standardized tests but report higher levels of stress than ever before. A new season of back-to-school is another wake-up call to let go of mounting pressure on kids and on schools to be more and do more. Schools can and should be a sanctuary for children in a high pressure world. A preschool classroom with child-sized tables and chairs, imaginative play centers and original child-interpreted artwork hung at child-eye view (i.e. messy and individual) is a place where your child is a master of her universe. She can help herself to art supplies or pretend she’s the family dog in housekeeping today. Your child feels competent, capable, responsible and resourceful every day in this miniature world. Every child discovers something that speaks to his heart because preschool celebrates diversity and individuality for children just beginning to learn who they are and what they love – the artist, the scientist, the explorer, the inventor, the caretaker, the storyteller and the negotiator. What is an early childhood curriculum? It is an organized collection of the wonders of childhood founded on the best questions of young minds – what, who, how, why. Your child comes home from preschool with a broader understanding of people and the world with the help of a teacher who wakes at 2:00a.m. to write down a new idea for tomorrow’s class. Most of all, preschool is silly and fun and very very loving. It’s smiles and hugs, and dirt and boogers too. You are sharing your child with an extraordinary group of people who hold magic in their hands. Preschool is an enchanted place but you need to believe too even if the year starts with a few uncertain tears, yours or your child’s. Believe in love and learning and also in play and mess-making. Believe in perfect imperfection and taking time to grow. This September, walk away from the race to nowhere and run to the nearest sandbox!